Orient Watch, which since 2009 has been a subsidiary of Seiko Epson but operates independently, is Japan’s largest producer of mechanical watches. My Digital Life had previously given away a Orient Watch Tank automatic watch, and now there is another chance to win another mechanical watch. As a side note, Orient Watch does produce both quartz and mechanical watches, but it’s the mechanical watch that stands for ultimate value and aesthetic. For example, the Orient CEZ05003B, from Orient Watch’s Racing sports collection, is a masterly crafted timepiece with style. Courtesy of Orient Watch, My Digital Life has one (1) automatic mechanical watch from Orient Watch to give away, as shown in photo. 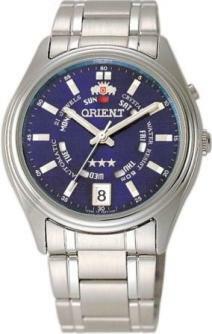 The prize of the giveaway of is a Orient Men’s Automatic Day and Date Fashion Dress Watch with blue dial face. The watch features stainless steel case, stationary stainless steel bezel, roll stainless steel band, stainless steel link bracelet secured with a fold-over clasp, 21 jewels, screwed-down crown, scratch resistant mineral crystal, slim minute markers, discrete white Arabic numerals at five-minute intervals, and a unique dial featuring an easy-to-read day subdial surrounded by bold luminous silver-bar hour markers. The dial also includes an inner subdial that tracks the days as they pass, and a date calendar at the six o’clock position. Best of all, it’s an automatic mechanical watch, which functions without a battery and powers automatically with the movement of your arm. The watch is water-resistant to 165 feet (50 M). The Orient Watch recommended retail price costs around $135. To get yourself a chance to win the timepiece for free, simply post a reason of why you should get the watch or why you love the Orient Watch at the comment section. The entry can be of any length. More than one entry is allowed, however each person is entitled to just one prize. The best entry will get the watch. In the case of multiple good entries have been submitted, a lucky draw will be conducted to select the prize winner among the qualified and selected entries. Content Closed. Winner is Narinder. All entry must be posted together with a valid email address in the Email text box (no email address is required inside the writeup to avoid spam). Invalid email will automatically disqualify the entry. Email address will be used solely to contact the winner. Winner must also give a mailing address for the purpose of prize delivery. The contest is opened for residents in United States only. All entry (comment) must be posted before or on 23:59 PM April 9, 2010 according to time stamp that appears on the every comment posted. The timestamp is based on GMT + 8. My Digital Life reserves the rights to change the terms and conditions of the giveaway contest without prior notice, and all decisions is final. Do check out more free giveaway available at My Digital Life.